a power full journey: Last Day to save $70 on 21 Day Fix Challenge Pack!! Last Day to save $70 on 21 Day Fix Challenge Pack!! There is no better day to decide to commit yourself to a lifestyle change!! WHY you might ask?! Well that's easy!! 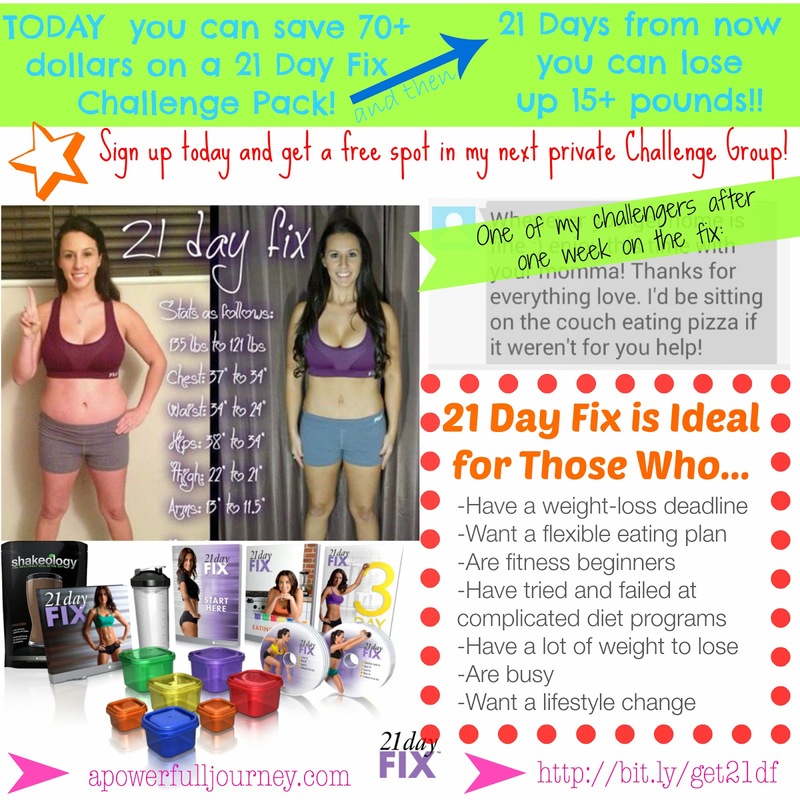 21 Day Fix, created by bikini competitor, Autumn Calabrese, is and AMAZING program that will get you ready for an event in a few weeks -- or if you want to become a "fixer for life" like I am!! Obviously saving $$$ is a HUGE bonus (offer expires at Midnight tonight!! ), you will have a free spot in my next private Challenge Group, but more importantly, you will fall in love with fitness and portion controlling because Autumn made it all SIMPLE!! **I'm starting a 21 Day Challenge Group, leading up to Halloween so we can help each other stay accountable and commit through the all of the temptations fall brings with cider, doughnuts and candy corn!! Who is with me?! I need you to help keep me on track too -- let's do this together!! Great price, fast results, and it only takes 21 Days to Make a Habit!! >>> For more details, or check more out about 21 Day Fix HERE! Or fill out an application for a Challenge Group HERE!